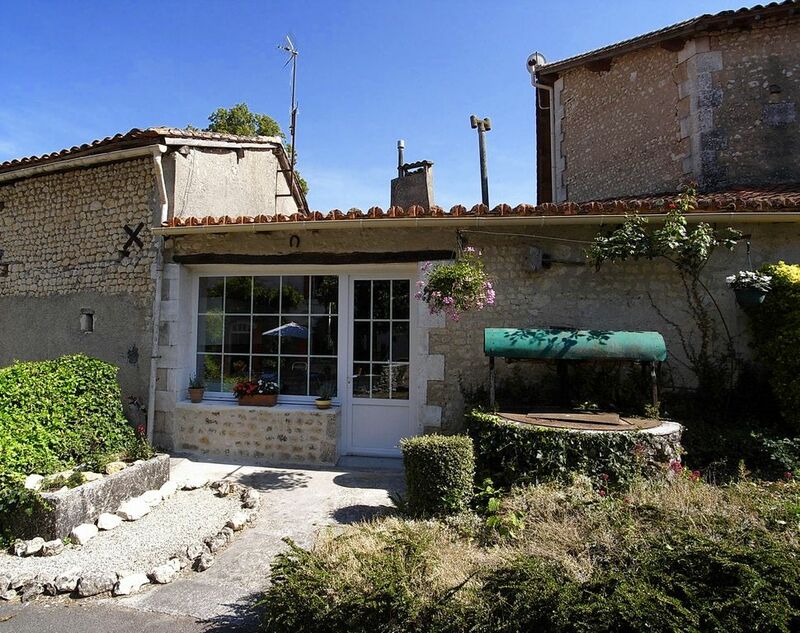 'La Petite Maison' is a charming well appointed holiday cottage and is situated in the heart of the South Charente region in a historic village called Poullignac. It is only 70kms north of Bordeaux and Royan, which is by the Atlantic Coast and it will take just 1hr30 minutes to get there.We tried to retain its original feel with a huge fireplace in the kitchen/diner and with beamed ceilings throughout it exudes charm and atmosphere.The cottage has 1 bedroom with en-suite shower. From the bedroom you can walk on to your own private patio with garden furniture, sun umbrella and your own B-B-Q. There is a Sitting room with a comfy sofa and TV/DVD player. Kitchen is well equipped with crockery and stove, but no oven. You will just find a Microwave. A Washing machine and Fridge is also available. The Bedroom has a double bed surrounded with a mosquito net, which is for decoration only as we don't have a problem with insects. From the bedroom a door leads in to the shower room where you will find a shower, toilet and basin. Outside is the pool which measures 5x10m and is shared with the owners. Sun lounges are available and towels are provided. You can also walk around in the 2.5 acres of garden where you find fruit trees and where our chickens are. You can make your holiday as relaxing as you like by staying at 'La Petite Maison' and catching some rays by the pool or you can go out and explore the local markets, restaurants or the countryside. I have been living in this lovely part of France for nearly 11 years. I was born and raised in Germany but lived for a long time in London where I met my husband. We have 2 lovely children, both born here and they enjoy the french lifestyle. I have been running our Gite for a few years as I love meeting new people and hearing their stories. When guests leave it always feels like we have gained new friends. When we decided to buy a house in France we did not really know which area. In fact we started looking around Lyon and travelled across France until we ended up here in the lovely Charente. We arrived here and just fell in love with the area as the people were so nice and helpful. Everything just looked great. At the time I needed to travel to Paris once a week and it was so easy to get to Angouleme and from there take the TGV up to the Airport in Paris. Plus getting to the UK was no problem either, as Bordeaux airport is only an hour away with British Airways flights to Gatwick. Very convenient. So, with all this easy access to the hustle and bustle to the cities we still find our village nice and remote enough to really relax. Our property is convenient located to enjoy tranquility, peacefulness and on the other hand it's not too far to enjoy some 'life'. So, if you decide to come and visit you can have it both ways. Relax by the pool and read a book - forget about everything. Or get in the car and drive for half an hour to look at some attractions or to enter a bigger city to get shops, lots of restaurants and nightlife. Supermarkets are about 14 kms away. You will find Banks, Doctors, Pharmacies at these places as well. Local Markets are about the same distances. About 10kms away you will find a Spa with indoor pool and massage.